We could just tell our child “no” and be done with it in some things. Or we could use this as a training opportunity in the praying, researching, planning, and earning what they desire. Not everything they want is bad—but not everything is necessary or even useful. Taking the time to train them on the steps of figuring out what they need versus what they want can be a useful tip for a lifetime. “You, then, who teach others, do you not teach yourself?” (Romans 2:21). These tips are most difficult for the parent who hasn’t learned to tell themselves “no”. Discipline is a necessary character trait for all believers. We must tell our flesh “no” in order for us to really mature in our spiritual walk. We teach our children best in what we do more than what we say; therefore, it’s necessary for us to resist the grown up marketing messages and learn our way of contentment through Christ. The harder kids have to work for something they want—it may become more or less of a value to them. When they’ve earned what they wanted—typically they will take better care of it or they will come to see that it wasn’t worth it. Either way they learn a valuable lesson on weighing the worth of desired objects. Young children can do many chores around the home to earn what they desire. Keep their work hard enough to make it matter, but not too difficult that they give up. “A discerning person keeps wisdom in view, but a fool’s eyes wander to the ends of the earth” (Proverbs 17:24). Discernment is acquired through the practice of stepping back and looking at the big picture. This is a time of teaching and helping your children come to their own conclusions when they are faced with facts and not just marketing promises. It’s wise to take the time and effort of talking through the marketing messages on TV, Internet, and billboards on your child’s level. Children can recognize when they are being duped if they are trained to ask the right questions: do I need this? Have I prayed about this? Does this do anything to help me grow in Christ? Can it become an idol in my life? “I want you to recall the words spoken in the past by the holy prophets and the command given by our Lord and Savior through your apostles” (2 Peter 3:2). What does the Bible teach about our desires? There are many scriptures in which God relates how He will meet our desires—according to His will and not ours. James 4:1-4, Philippians 4:11-12, and Hebrews 13:5 are a few scriptures in which we learn to be content with what we have rather than attempting to get the next big thing. Have your children memorize these scriptures and teach them how to apply God’s word when they are tempted to listen to the marketing messages. 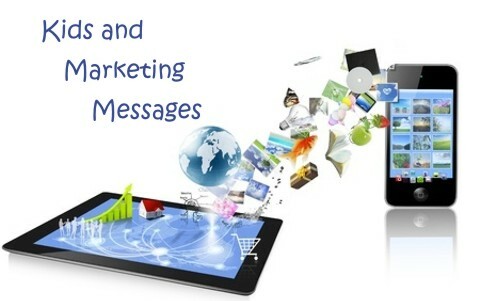 Marketing messages are most successful because they attempt to get into the minds of their target audience. If they can make our children believe that they must have their product, the whining, crying, and fussing is to work the parents over. However if we teach them the principles of correct thinking about the messages, our children have a great chance of walking away without regret. Nothing speaks more about the value of something our children desire than that of time. Putting distance between the urgency of the marketing message often is enough for most people to walk away from it. Parents can put a designated time on objects with boundaries or requirements before their children can attain what they desire. Many times they will even forget about it because it wasn’t really what they wanted or what they were willing to work for. What is the message saying? Not every marketing message is negative, but there’s a purpose for each one. Your children should leave your home one day as marketing message experts based on your example and prayerful guidance. Thanks Crystal! What encouraging and inspiring articles! Keep up the wise words……God bless you! Thanks Crystal! For all of your encouraging and inspiring articles. Keep up the wise words. God bless you!